On Saturday 21st November, at 3pm, affiliates of Strategic Optimism Football and the Luther Blissett Deptford League will present a workshop in practical triolectics, conducted via the medium of three-sided football, as part of the revived AntiUniversity programme. A contemporary of the original AntiUniversity in the 1960s, the artist Asger Jorn also rejected transactional modes of knowledge transfer, favouring experimental activity. A supporter of the Situationist Bauhaus in Sweden, he believed such experiments fundamental to both psychic and social revolution. Underpinning Jorn’s approach was his unique ‘triloectical’ system. Developing upon dialectics and quantum physics, it went beyond linear transfers of energy, constructing spatio-temporal fields of possibility and negotiation. Not oppositional but superpositional – contradictions resolved by blending multiple simultaneous potentialities. As a practical pedagogical exploration of the triolectical system, three-sided football stands in continuity with the aims of the AntiUniversity’s original protagonists, including Jorn’s fellow ex-situationist, Alex Trocchi. 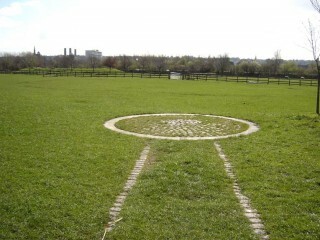 The game has formerly been played at locations of psychogeographical significance around the world – from a forest at the centrepoint of Europe, to Taksim Square, to inside a Soviet fuel silo, to a druidic stone circle. This time we have selected the significant, if little known undulating terrain surrounding the Omphalos of the British Empire – constructed in the 16th Century by John Dee – as part of an ongoing campaign towards the psychogeographical unbinding of Eurocentric geometrical thought.